통일신라 후기의 대표적인 작품으로 실상사 창건 당시부터 지금까지 보존되어 오고 있는 유명한 철불이다. 통일신라 후기에는 지방의 선종사원을 중심으로 철로 만든 불상이 활발하게 만들어졌는데, 이 불상 역시 한 예로서 당시의 불상 양식을 잘 표현하고 있다. 머리에는 소라 모양의 머리칼을 기교있게 붙여 놓았고, 정수리 위에는 상투 모양의 머리(육계)가 아담한 크기로 자리잡고 있다. 귀는 그런대로 긴 편이고, 목에 있는 3줄의 주름인 삼도(三道)는 겨우 표현되고 있다. 좁아진 이마, 초생달 모양의 바로 뜬 눈, 다문 입 등의 근엄한 묘사는 이전의 활기차고 부드러운 모습과는 판이하게 다르다. 어깨선이 부드럽고 가슴도 볼륨있게 처리되었지만 전반적으로 다소 둔중한 느낌을 주며, 양 어깨에 모두 걸쳐 입은 옷 역시 아래로 내려올수록 무거운 느낌을 준다. 옷주름은 U자형으로 짧게 표현되고 있는데 이것은 당시에 유행하던 옷주름 표현기법으로 비교적 자연스러운 모습이다. 이상과 같은 특징을 지닌 실상사 철제여래좌상은 긴장감과 활력이 넘치던 8세기의 불상이 다소 느슨해지고 탄력이 줄어드는 9세기 불상으로 변화하는 과도기적인 작품이라는 점에 그 의의를 둘 수 있다. 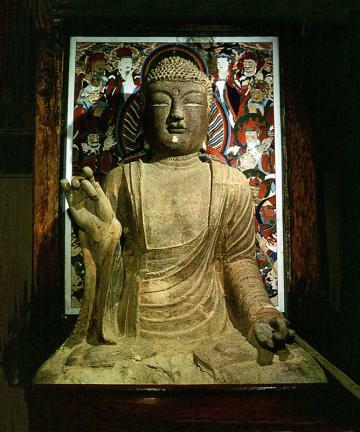 A representative artwork of the late Unified Silla period, this iron statue of a seated Buddha has been preserved since the foundation of Silsangsa Temple in the early ninth century and is justly very famous. 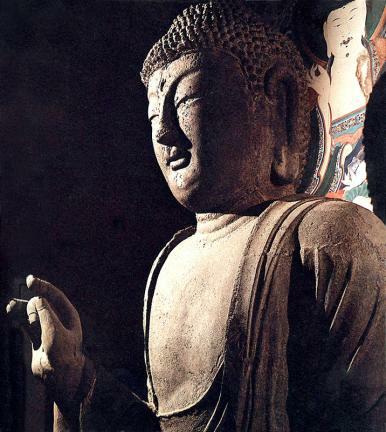 During the late Unified Silla Period, iron statues of Buddha were made by many Zen Buddhist temples around the country, and this particular example clearly exhibits the style of Buddha statues of that time. The Buddha’s hair is expressed in the curly nabal style (i.e. twirled up and around in a seashell-shaped fashion), and a small usnisa (a protuberance symbolizing supreme wisdom) can be seen on top of his head. The Buddha’s ears are reasonably long, while the samdo, i.e. the three wrinkles on the neck, can hardly be seen. The low brow, crescent-shaped eyes, and closed mouth convey a serious expression unlike the lively, gentle image of the Buddha statues of the previous period. Although the Buddha’s shoulders are smooth and his chest curved, the overall impression is of a dull clumsiness, while the Buddha’s beobui (sacerdotal robe), draped over both shoulders, gives off a heavy feeling. The wrinkles in the garments are shaped like short "U"s, a popular technique of the time. The iron seated Buddha at Silsangsa Temple was one of many iron statues made during the period of transition from the tense and vital works of the eighth century to the more subdued style of the ninth century.